Belvedere restaurant boasts striking interiors and a recently re-imagined menu. Building on a rich, 25-year history of exceptional cuisine, The Belvedere – under the direction of Executive Chef David Codney – features Mediterranean-inspired dishes with a focus on locally sourced ingredients and wild-caught seafood. 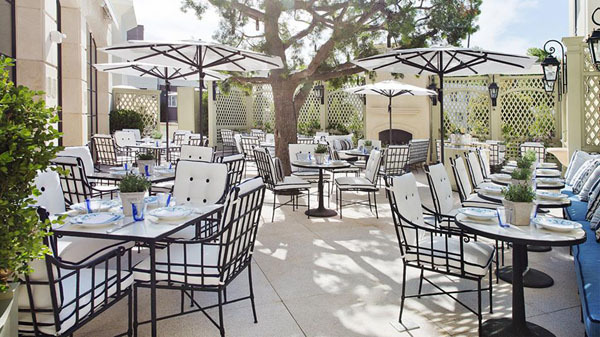 A defining feature of the space is The Terrace: a stunning al fresco dining destination in the heart of Beverly Hills. Richly landscaped treillage frame the expansive space to showcase verdant greenery, French limestone fountains and a flickering outdoor fireplace. As Executive Chef at The Peninsula Beverly Hills, Chef Codney oversees all aspects of the hotel’s cuisine, including the contemporary Mediterranean-inspired fare at The Belvedere, the only AAA Five Diamond restaurant in Southern California every year since 1993, and the al fresco Roof Garden. Executive Chef David Codney has developed a thoughtful menu that caters to the seasonality of regionally sourced ingredients. Working with responsible farmers and companies who raise animals and grow produce with respect to the environment and local economy, the menu focuses on unique, locally- and seasonally-sourced ingredients presented in a simplistic, approachable manner. Adjacent to The Living Room and The Belvedere restaurant, The Peninsula Beverly Hill’s Private Dining Room adds a luxurious and intimate dining experience for guests. Featuring pieces from The Belvedere’s breathtaking contemporary art collection, the space is the perfect setting for wedding and bridal showers, meetings and gourmet dinners. A private patio offers space for al fresco cocktails. Displayed along the perimeter of The Belvedere’s white linen walls, The Peninsula Beverly Hills recently debuted a collection of privately curated art within the newly remodeled restaurant. The restaurant’s bright and spacious interior now serves as the perfect backdrop for 11 breathtaking works by acclaimed international artists such as Yayoi Kusama, Sean Scully and Robert Indiana, as well a striking Fabienne Verdier piece commissioned specifically for the restaurant. 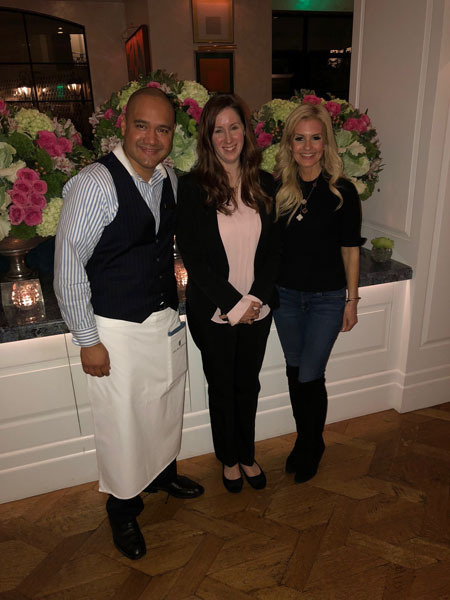 I had the pleasure of dining at the newly renovated Belvedere restaurant at the gorgeous Peninsula Hotel in Beverly Hills. This is where the Hollywood elite come to enjoy this all-day menu of Mediterranean dishes. From the moment, you walk into the restaurant, you are greeted with the warmest of welcomes and beautiful flower décor and its true elegance without being stuffy. We were seated at a beautifully decorated round table that had a view looking out to a cozy patio with outdoor seating. The staff was amazingly attentive and especially our server James Hernandez, who made sure we were well taken care of and to ensure the most pleasurable experience possible. If you are not satisfied with something, they make sure to make it right. James was so knowledgeable about the menu and every detail mattered. We were then greeted by the Sous Chef Kelsi Armijo who was excited about the amazing menu that Chef David Codney had created with her and their team. We started with Sous Chefs Kelsi’s suggestions: Charred Caesar, Spanish Octopus, Grass-fed Lamb-Burger Meatballs and Salmon Flatbread. I ordered the Burrata and Beets, Beef Tartare, Hearth Pita with Hummus and Baba Ganoush. The flavors in the meatballs were aromatic with a hint of sweet from the raisins. The Charred Caesar had wonderful texture and by charring, truly opened up the flavors without being over powered by dressing. The Burrata melted in your mouth and was the highest quality with some citrus and beets which gave it a refreshingly flair. The Hearth Pita is homemade on premises with a hint of sourdough flavor served with the creamiest Hummus and Baba Ganoush which was extremely flavorful with the freshest herbs yet not overly seasoned. By the time dinner was served we could barely take another bite since we were surrounded by amazing appetizers. 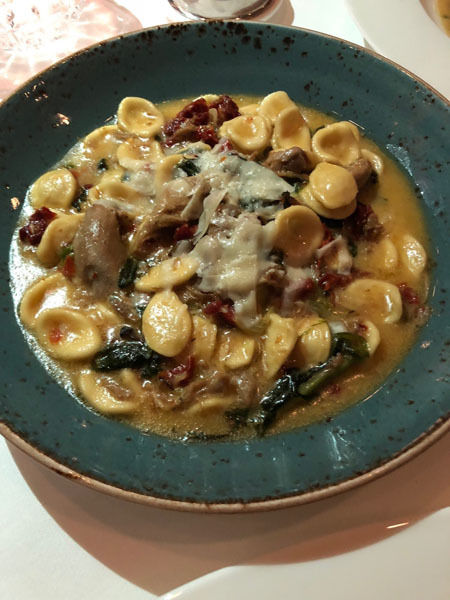 Sous Chef Kelsi recommended the Duck Confit Orecchiette which had tender pieces of duck with hints of escarole and sundried tomato. This was seasoned perfectly and the sundried tomato popped with flavor yet was not overpowering. The Seared Scallops dish was a table favorite! They melted in your mouth and a must try on the menu. The next dish was a winner and reminded me of a seafood paella- the Lobster Bouillabaisse served with ciabatta, Rouille, clams, mussels and shrimp. The flavors were in perfect harmony of each other. A hearty dish you cannot miss! I would have never guessed Ciabatta, but it worked. If you can leave room for dessert, and I suggest you do, a must have Sous Chef choice, the Faberge Egg. It is a must have just on presentation alone. It was so gorgeous we felt guilty cracking it open to taste. Once we did, it was a white and milk chocolate heaven. The next dessert was the Apple Strudel which looked nothing like apple strudel. It was also a work of art and flavorful with a smooth textured of apple filling that looked like it was inside an eggroll shell. Flavors were subtle, yet the apple flavor stood out and the sour cream was a nice addition to the sweet. I have to say I have had the privilege of dining at many 5 star restaurants yet The Belvedere, by far, stands out. From the comfortable yet elegant dining area, to the top-notch team who made us feel as if we were royals, to the exceptional creativity and quality of the menu choices, it was an amazing dining experience. A MUST visit in Beverly Hills.